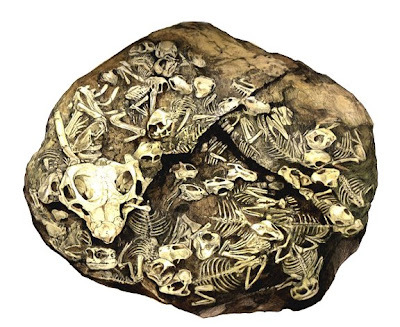 This fossil illustrated here is proof that some species of dinosaurs lived in family groups, with the young living in a nest with a parent. 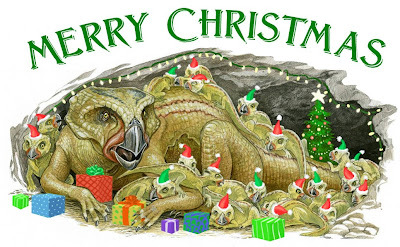 Christmas wish list: The Fossilized Psittacosaur Family has one wish--to come to life and celebrate the night before Christmas! They need your help! Please comment, if there are enough comments, I'm sure the Psittacosaurs will come to LIFE! and folks getting cooked by volcanos." 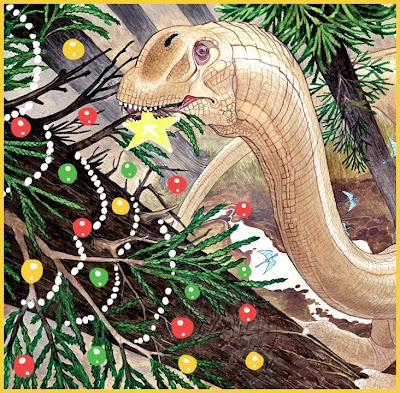 That's my Christmas song about dinosaur extinction, it didn't make the book, it's a work in progress. Purple Devilsaurus can be seen here, in her natural habitat, a crowded doorway. (Lower left corner, with the Barbie.) This particular Purple Devilsaurus is from a page in The Devil You Know. Christmas wish list: Purple Devil--"HEY! Is that YELLOWBELLY AND PLUM behind her! Wow! This is such a big surprise! Tell us, what are you working on? Will there be a sequel to your big hit book? What do YOU want for Christmas? This is fantastic!" ....Purple Devilsaurus just wants a little peace and quiet. Isn't he super! I love it! 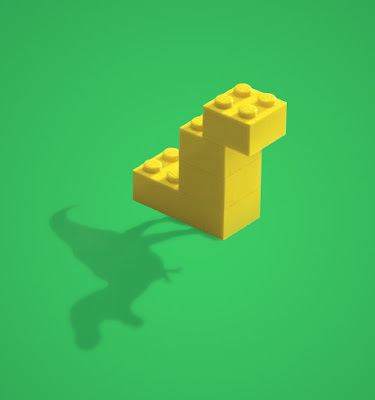 The image for LEGOsaurus is not mine, it is clipped from a European ad campaign. 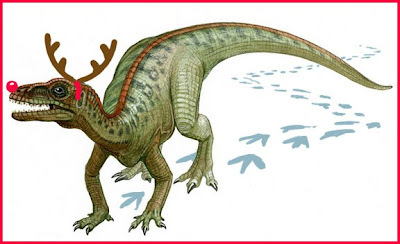 Christmas wish list: LEGOsaurus needs nothing. He is completely at peace with existence. [UPDATE] The Layton Barnes & Noble signing is off. I woke up soooo sick. Hello Ther-a-flu, how are you? Plateosaurus traveled in herds across Europe, during the Triassic period, when Europe was a desert. Like humans, Plateosaurus had five digits on each hand. 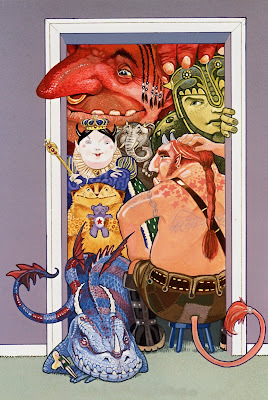 Christmas wish list: Rapunzel's Revenge--in HARDCOVER, which is getting hard to find, it's now back ordered on Amazon. Scientists claim Stegosaurus was an herbivore, grazing on plants. But I have a different theory. 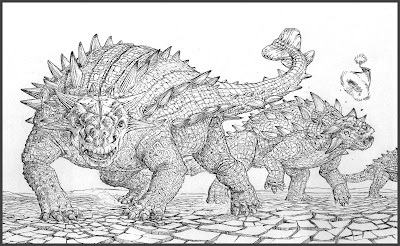 I think Stegosaurus was a meat eater, and this is how it operated: it would charge under the belly of a larger dinosaur, the plates on its back would slice open the dino from underneath, and all the guts would fall out. 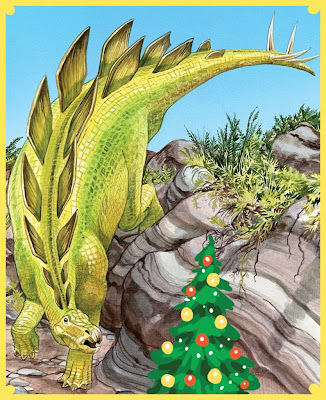 Then Stegosaurus would use the spikes on its tail to shish-kebab the guts for later. It's gross, but it's my theory. 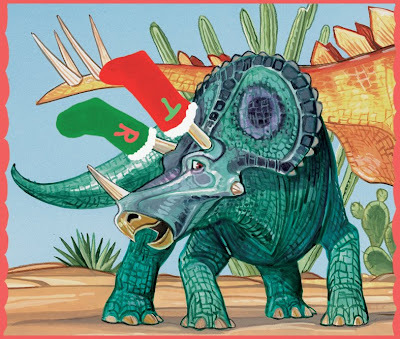 Christmas wish list: All Stegosaurus wants for Christmas is his two front teeth. 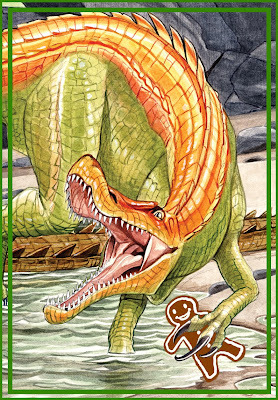 I don't have any neat facts about Suchomimus, other than that he looks wicked awesome. I have to say that Suchomimus, for my money, is a cooler, scarier dinosaur than T. Rex. Big spiney back, long crocodile face, giant claws, why doesn't he have his own movie? 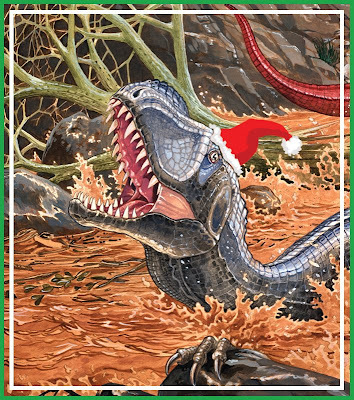 Christmas wish list: The only thing Suchomimus wants is an extra two months to finish the drawings for his gigantic graphic novel project. 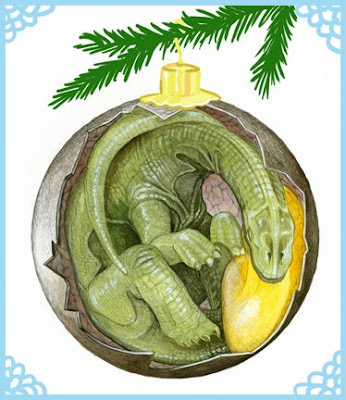 Suchomimus is very short on time. To eat an Ankylosaur, a predator would probably have to flip it over onto its back. The heavy, armored spikes would then be out of the way. Of course, the predator would still have that club tail swinging for the ankles. 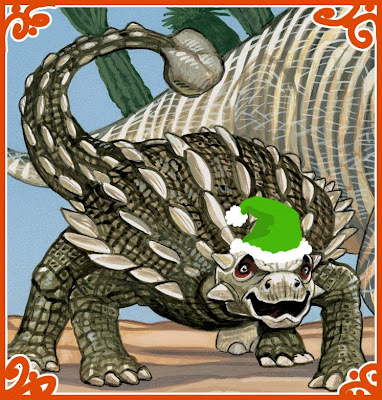 Maybe that's why it is called ANKYLosaur--it swings for the ankles. Christmas wish list: A gong. Ankylosaur could whale away at a gong for days. Amargasaurus was a small sauropod who lived in South America. It had long, bony spines along its back. 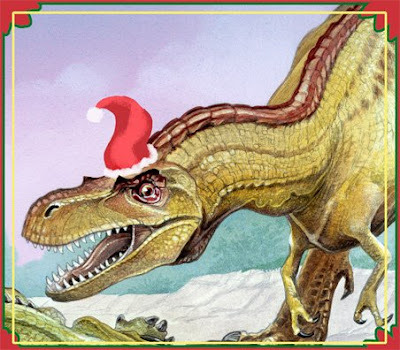 Christmas wish list: That the thing in the previous post, about Carnotaur's jaw not being strong enough to stop large prey, is true. Triceratops was discovered in Wyoming by John Bell Hatcher. He discovered 32 Triceratops skulls in one county. Christmas wish list: One year membership to the Jelly-of-the-Month club. "That's the gift that keeps on givin' the whole year long." Apatosaurus is the correct name for the sauropod commonly referred to as Brontosaurus. Apatosaurus was identified and named first. 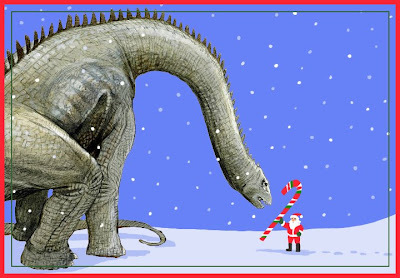 Two years later, in 1879, Brontosaurs was discovered. Further study proved they were the same species. You might think the guy who discovered Brontosaurus would be angry, nope, same guy discovered both. Christmas wish list: Rock Band 2. Apatosaurus thinks Rock Band is ten times better than Guitar Hero. And she is right. 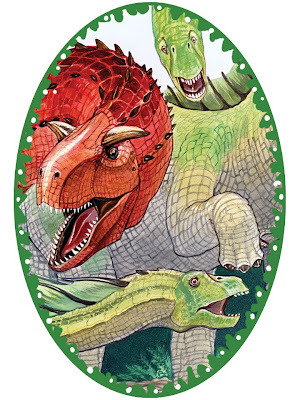 Styracosaur is the one in the back, with all the horns. 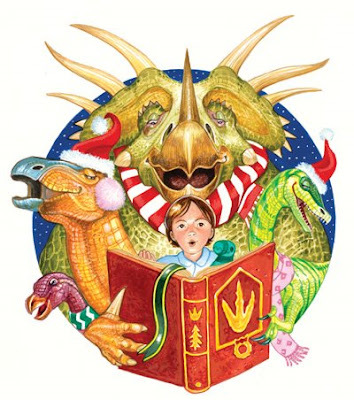 I know, I know, these are supposed to be dinosaurs that AREN'T in The Dinosaurs' Night Before Christmas--but this is from the back cover, so technically not in the book. Christmas wish list. 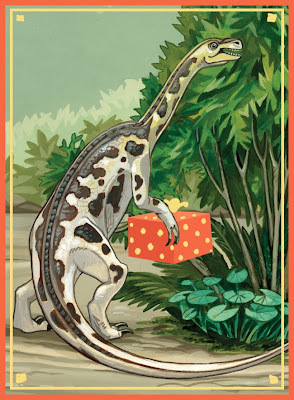 Too bad Styracosaur, you don't get a wish list, today is my birthday (the 8th...the day I'm putting this together) and I get to post MY wish list. I want everyone to buy this book, and all my other books. Also I want the LEGO Coast Guard Chopper. Greetings to the folks who wandered over from Facebook. I just signed up today, I've been looking at photos of all my old classmates. What a fascinating, technological age we live in. New fossil evidence shows that Diplodocus had a row of spines along its back, like the modern day iguana. Those would have been pretty big spines. Christmas wish list: "I'd like another one of those big candy canes, Santa. Do you have Ginkgo flavor?" Christmas wish list: Two pair of skis, two pair of boots, season pass. 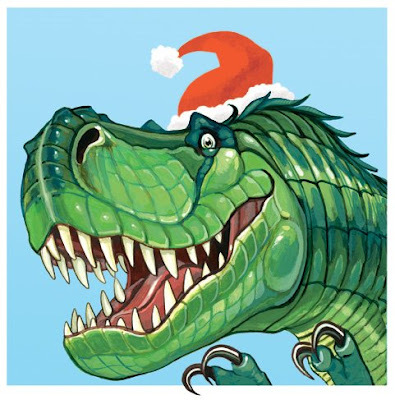 An early version of "Santasaurus" looked very similar to this T. Rex, after looking at all those rows of teeth, the publishers and I decided that Santasaurus would work better as an herbivore. Christmas wish list: Pom-poms and a trampoline. 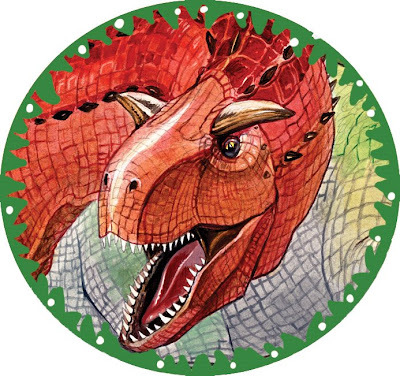 This T. Rex made his appearance in this book and floor puzzle. From the Triassic Period, Eoraptor is one of the earliest known dinosaurs. 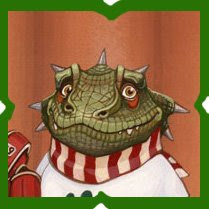 Christmas wish list: A Very Marley Christmas--not the book, he wants to eat Marley the dog for Christmas. Although, since he's only three feet long, Marley might eat the Eoraptor. 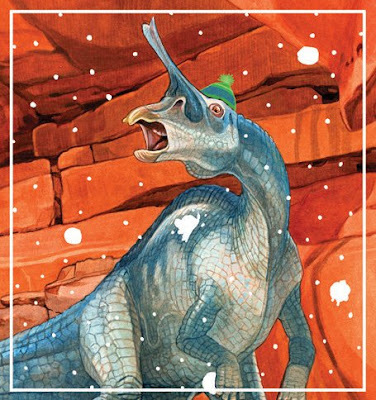 Tsintaosaurus was a hadrosaur from China with an unusual head crest. Christmas wish list: Unusual head crest cozy, something wool, like a hat, only taller and thinner. Eggs from the Sauropod family (Brachiosaurus, Apatosaurus, "Long Necks," etc.) were spherical and had a very thick shell. Christmas wish list: Baby Mozart CD, padded headphones.